In today's review, I have a few new Geek Chic Cosmetics lacquers to share with you! These all have geeky inspirations from a wide variety of sources. I'm sure there is something for everyone here! 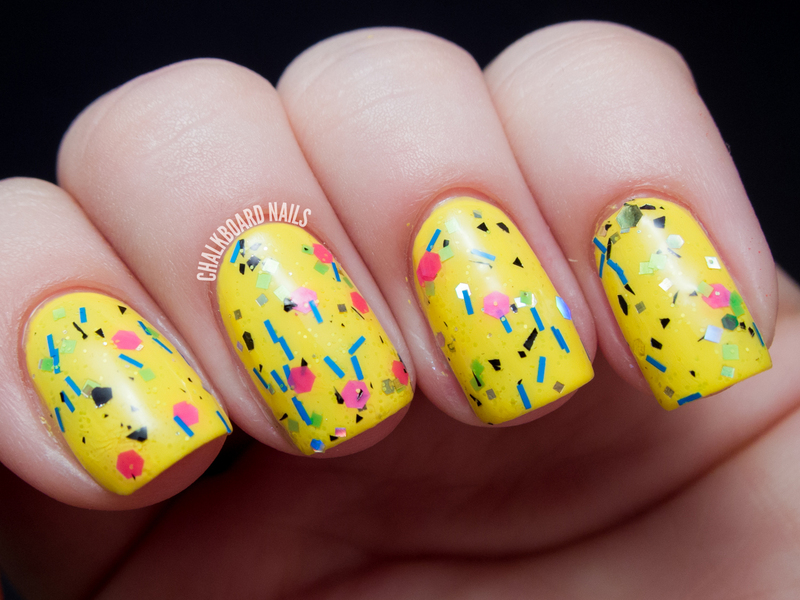 Dream of the 90s is a neon glitter topper in a clear base. The polish has bright blue bars, pink hexes, smaller neon green pieces and squares, and black shreds. I've layered one coat here over China Glaze Happy Go Lucky for a look that is maybe a little more 80s than 90s -- though it's ridiculously fun either way. Inspired by Portlandia. Specimen is a mix of blues and golds, including microshimmer and circle glitter! I think the microshimmer in this really makes it special, though the dot glitter doesn't hurt, of course. I've layered it here over black to show off the shimmers, but I know this one would also look stunning over a navy blue. Inspired by Elizabeth from Bioshock Infinite. 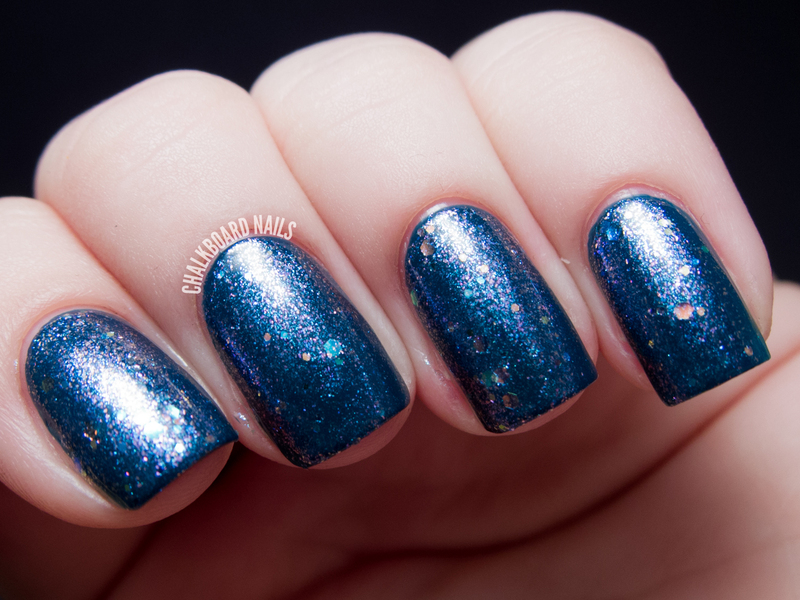 Star Stuff is a iridescent glitter and microshimmer topper that flashes pink and turquoise. What I really like about this one is the fact that while the shimmer takes over in the sun, the iridescent glitters really pop in the shade. One coat shown over OPI Ski Teal We Drop. Inspired by Carl Sagan. I think all three of these are very strong offerings from Geek Chic Cosmetics. The formulas were easy to use and they are all nicely varied. Which one do you like the best? If you could create a polish inspired by a geeky source, what would you choose? Geek Chic Cosmetics lacquers are available to purchase on geekchiccosmetics.com. You can also keep up with them on Facebook & Twitter. my favorite of these has to be 'star stuff'...but overall I like first picture the best...that glitter goes great with yellow, but i cant see it combined with other colors. Dream of the 90s is so fun!! The first one is so cute , but the Star Stuff is so gorgeous!! The yellow mani pops out! It looks great on your skin tone!